In the last post, we considered the various motives and responses to Jesus that one finds in Luke 19. Jesus' triumphal entry into Jerusalem is situated within the wider context of Luke 19. Each of the four Gospels include Jesus' entry into Jerusalem (Matthew 21:1-11, 14-17; Mark 11:1-11; Luke 19:29-44; John 12:12-19). We want to consider Luke's version of the event by focusing on two main areas. We first want to better understand why Jesus chose to ride in on a donkey, since His choice of mount communicates much of what He intended to present to the people. Then secondly, today’s post aims to have you examine your heart to see how much of your life He has. The goal will be to urge us all to give our all to this King Jesus Who so desires a triumphal entry into our lives. The choice of a donkey in preference to a white stallion was intentional on Jesus' part. The donkey and two other details of Jesus' entry merit further examination to discern what exactly what happening on the first Palm Sunday. First, Roman generals rode stallions, and thus if Jesus would had ridden into Jerusalem in this manner, it would had attracted the wrong kind of attention - leading to possible pre-mature execution. By the end of the week, Jesus would be executed by the Roman authorities, per God's timing and plan (Acts 2:22-24). The timing of everything was in view. If anything, the choice of a donkey was intended for the Jews gathering to celebrate the Passover. "So Zadok the priest, Nathan the prophet, Benaiah the son of Jehoiada, the Cherethites, and the Pelethites went down and had Solomon ride on King David’s mule, and brought him to Gihon. 39 Zadok the priest then took the horn of oil from the tent and anointed Solomon. Then they blew the trumpet, and all the people said, “Long live King Solomon!” 40 All the people went up after him, and the people were playing on flutes and rejoicing with great joy, so that the earth shook at their noise." "Although presentation of palm branches was mentioned by only one Gospel writer, I suggest their use at the Triumphal Entry was a deliberate act, full of symbolism. The people were proclaiming nationalistic pride and their desire to be free of Roman rule. 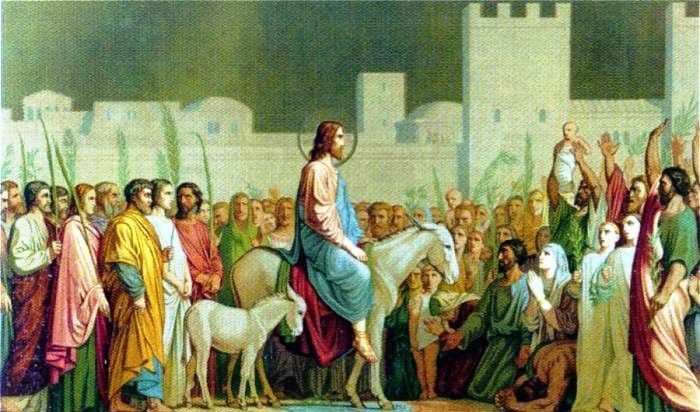 As Jesus rode by the crowd they shouted “Blessed is the king of Israel.” The message was clear. They were looking for deliverance from Roman tyranny and they tied that hope to Jesus, whose miraculous powers made Him a powerful foe to the Romans. By presenting the palm branches to Him, the people were declaring their loyalty to Him as a victorious general or king might expect." These three details show us not only Jesus' actions in clearer detail, but also the people's intentions. The people were ready to make Jesus their King - however, their conception of the type of King they wanted versus what Jesus came to portray were diametrically opposed. In short, thought the people proclaimed with their lips "Hosanna", their concept of kingship rejected Jesus. As we already mentioned, the scene of Jesus riding into Jerusalem depicts various attitudes and levels of reception. Jesus' response to the scene is telling. We find that in the final analysis, the people were willing to give only part of their lives to Jesus. Jesus is an all or nothing Savior. Either we give Him all our hearts or we will find our souls in a tug of war between our allegiance to Him on the one hand and the world on the other. As Jesus reminds us: "you cannot serve two masters, for either you will love the one and hate the other, or cling to the one and despise the other" (Matthew 6:24). When it comes to our hearts, Jesus wants to have your…. The people admired Jesus for His miracle working powers, as seen in the parallel account of John 12:18 and in Luke 19:37. As one preacher has noted, these people were "fans", not "followers". The Pharisees were wanting the fanatical crowds to silence their shouts of Hosanna for what might had been partly legitimate reasons. Nevertheless, Jesus' could see deep down in their hearts. The Pharisees were not merely concerned about the crowds possibly stirring up unwanted trouble from the Romans. Jesus saw there truest and deepest intent: namely, the Pharisees didn't feel that Jesus the worth the praise, whether ill-conceived by most in the crowd or truly meant by His closest followers. After all, the worshipers were quoting Psalm 118! All we know is that by the end of Luke 19, the Pharisaic and Jewish rulers revealed their true colors. Things were going to quickly unravel and it would be a matter of days until they had their sworn enemy crucified. As was just mentioned, things were unraveling. The undercurrent of hatred for the Lord Jesus Christ was poised to boil-over. As we close out this post today, we have considered the historical backdrop of Jesus' entry into Jerusalem in Luke 19. We have also considered some life-practical lessons to be gleaned from this account. So the question is: How much of you ought Jesus to have? The answer is "all of you" and "all of me". We read in the latter part of Luke 19:48 that the "people were hanging on to every word He said." When we couple this statement with the example set by Zaccheus in Luke 19:1-10, we find that Jesus ought to have all our life, time, possessions and attention. As the saying goes: "He is either Lord of all or not Lord at all".